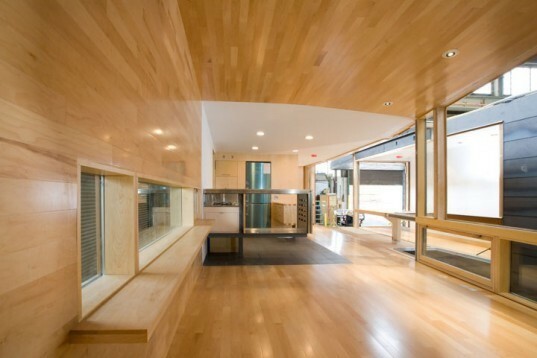 The Koby Cottage was designed by Garrison Architects for a boarding school for troubled teens in order to allow families to visit with their children in a private, domestic setting surrounded by nature. The 1,100 square foot prefab cottage consists of two modules raised and separated for light, space and privacy. Koby is the first building constructed using the KFS (Kullman Frame System), an extremely strong and efficient modular space frame system consisting of hollow tubular steel and allowing large cantilevers and window openings. The Koby Cottage is a prototype structure featuring a system designed for the construction of multi-story modular buildings — its tubular steel space frame has the unique capacity to achieve heights of twelve stories using a patented connection system that minimizes field finishing and speeds the overall construction process. 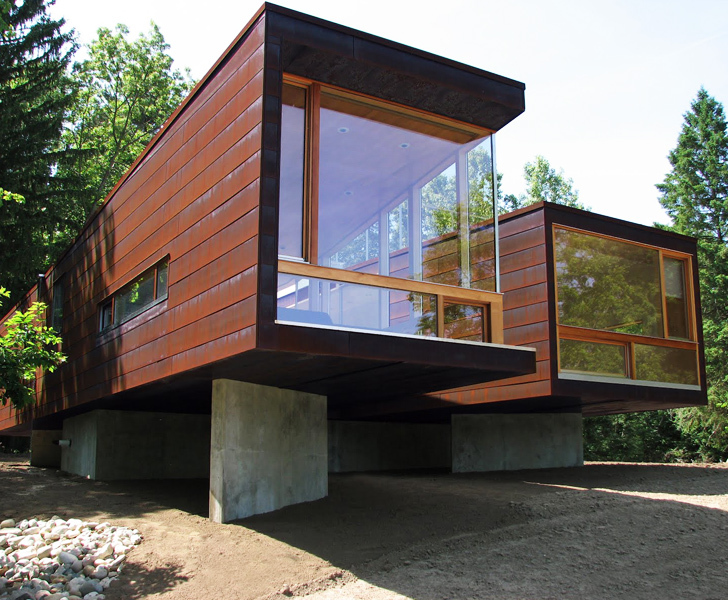 The space between the modules is enclosed with glass, and the cottage plan has an ‘X’ form. The dining table is situated at the structure’s crossing, creating a place for rejoining and discussion. Koby features a high level of craftmanship and detail as well as number of high performance components.